We’ve just returned from the Royal Easter Show. You forget how beautiful the weather can be, Sunny with a cooler edge to the temperature, perfect days. And happy families with their kids skipping along. So much to see and do. Of course we spend a lot of time in the Sheep Pavillion. Our sheep did so well. 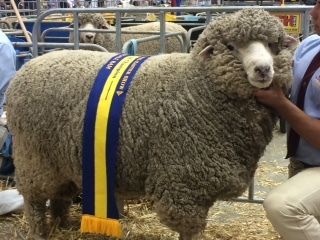 Hornblower got Reserve Champion Ram and Gallagher our Supreme Corriedale Champion Ram at Dubbo last year, got the Best Head. This is a great picture of Ellie our granddaughter with Gallagher with his ribbon for best head. 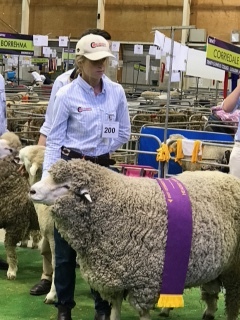 Ellie is the fourth generation Carter to be holding prize winning Corriedales at the Royal Easter Show in Sydney. We have to thank Trinity College for their help in showing our sheep. We have had a long association with the schools – in their previous names Marion College and St Pats College. – and we wish to thank Lachlan, Tariq, Owen, Micaela and Annabel for their enthusiasm and excellent abilities. 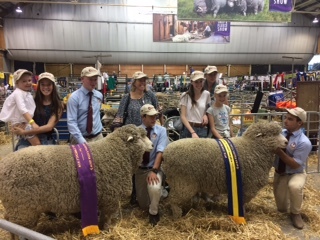 This is a wonderful picture with our two prize winning rams Hornblower, Reserve Grand Champion 2017 and Gallagher, Supreme Dubbo Sheep Show, 2016 and Best Head 2017. at the RAS with their strong Billigaboo support team, and our excellent handlers from Trinity. College Goulburn. And finally, Billigaboo Hornblower- our Reserve Champion Ram for 2017.